As an artist and scholar, I am interested in looking at how technologies raise ontological questions and become part of our constructions of identity; how they manifest in real and symbolic power associated with individuals and institutions; and how we might use them to increase agency and creative expression. In my art practice, I experiment with the dramatic possibilities of technologies in channeling desire. The work is largely about seduction, paradox, play, and quandary—it thrives in spaces that are politically charged (as the Internet is). For example, the project entitled Pieces of Herself is an ironic exploration of feminine embodiment and identity in relationship to public and private space. 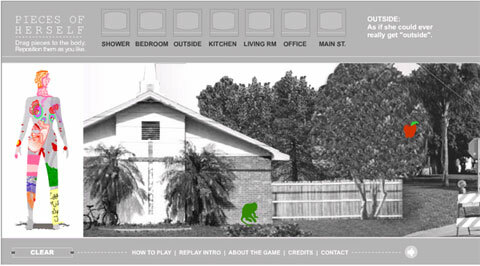 Using a drag-and-drop game interface, viewers scroll through familiar environments (e.g., domestic, outdoor, work—which are projected onto a wall) to collect metaphoric "pieces" of the self and arrange them in compositions inside the image of a body. As each piece enters the body, it triggers audio clips from interviews with women, music loops, sound effects, etc., so that layered narratives form. The project, which was inspired by Elizabeth Grosz's theories about embodiment, comments on social inscription of the body. My own interest in digital media per se stems from childhood, when my grandmother (a music teacher) engaged me in theater and musicianship, and my mother (an English professor) taught me a love of writing and literature. I developed a passion for exploring nontraditional narratives, which became evident from the time I conducted my undergraduate Honors English studies in modernist novels, with a thesis on William Faulkner as well as work on James Joyce. My study of narrative continued with a full academic scholarship to Brown University, where I undertook coursework in modernism, drama, and fiction writing, as well as other forms of literature towards my M.A.T. in English. Then, in the Vermont College MFA program, I developed my visual art talents and critical perspectives in visual culture---inspired by mentors such as Faith Wilding, Steve Kurtz, Laurie Palmer, and Claire Pentecost--to make meaningful work involving cultural critique.